I've been working hard on my energy saving plan. I finished my slippers first. Is it selfish that I made some for me first? My son, who thinks wool is wondrous stuff, begged for a pair too. 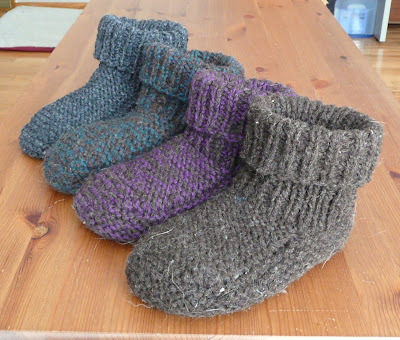 I decided to knit his pair next, even though B, who hates wool, was working on breaking in my slippers for me. His slippers are one strand of the miscellaneous NZ brown yarn and one strand of Briggs and Little Heritage in "Evergreen". He loves them. Even wears them in bed. Wears them without socks, with socks, to school for pajama day. They've needed washing already. Maybe I didn't need to knit them a size bigger to allow for growth. He may wear them out before he fully grows into them. B wanted a pair with purple, but didn't like any of the purple in the house. Which wasn't really a problem, since it was M's wool anyways and I try not to steal from his stash. That necessitated a trip into town to go to the yarn shop. (Such a hardship!) I picked up some Purple Paton's Classic Wool to pair with the NZ brown handspun. She loves them. The brown and purple go very well together. She "parks" them on the piano bench when not in use, because I refused to let her put them on the tables. While getting yarn for B, I also picked up two more skeins of Heritage in "Dark Grey" for G's slippers. He was somewhat surprised that I needed to buy yarn to make his slippers. "Really?! You don't have anything here that you could knit them out of?" I suppose, given the size of my stash, that is somewhat surprising to a non-knitter. So far he only has one slipper, but has pronounced it "very warm" and thinks I should make another pair for his Mom who will be visiting us in a few months. I may need to visit the yarn store again!